It’s “Driving Miss Daisy” meets “Hidden Figures” with a touch of “Ray” and a splash of “Planes, Trains and Automobiles”. “Green Book” is this year’s quintessential crowd-pleasing, feel-good, inspirational road trip movie that should become a holiday and awards season favorite. Director Peter Farrelly has taken a break from goofy comedies like “Dumb and Dumber” and “Hall Pass”. He goes solo (no brother Bobby this time) to tell a true story about a serious subject matter. Farrelly is also co-writer of “Green Book”, along with Brian Hayes Currie and Nick Vallelonga, the son of Viggo Mortensen’s character, Tony “Lip” Vallelonga. It’s 1962. Tony has lived in the same Bronx neighborhood his entire life, now with wife Dolores (played by Linda Cardellini), their two sons and their extended Italian families. Tony’s a brash and effective bouncer at Manhattan’s iconic Copacabana nightclub. Not surprisingly, he’s got a volatile attitude and colorful vocabulary. When the Copa closes for two months for renovations, Tony needs a temporary job to keep food on the table – and this guy likes to eat. He gets word that a local doctor is looking for a driver. When Tony arrives for his interview (at Carnegie Hall), he learns his potential employer isn’t a medical doctor, but Don Shirley, a renowned pianist, leader of the Don Shirley Trio, and an African American. “Moonlight” Oscar winner Mahershala Ali plays Shirley. Their first meeting is awkward for the refined musical genius and the rough-around-the-edges thug, who still hasn’t completely embraced the changing attitudes when it comes to race relations. But Shirley convinces Tony to be his driver for an 8-week concert tour he’s embarking on – from the Northeast to the Midwest and then into the deep South, where African Americans, even when they’re the “guest of honor” were still subject to the vile and inhumane treatment of the time, which often included violence. The title “Green Book” comes from the paperback guide that listed the hotels and restaurants that African Americans were forced to visit while traveling in the South. Over the course of their two-month journey, taken in a bright turquoise car, these two very different men engage each other in a verbal jousting match of sorts. They debate issues of race and culture, often getting there in roundabout ways. A visit to a Kentucky Fried Chicken in Kentucky becomes enlightening for both of them. Sometimes funny, sometimes poignant, you never know what topic will come up next. 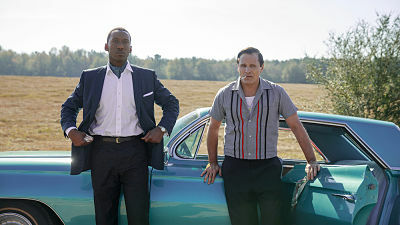 “Green Book” isn’t the most dramatic, explicit or deepest treatment of race relations during the civil rights period. The tone is fairly light throughout. But the minimalist, offbeat approach actually works. A lot of times you just get the point trying to be made – without it having to be shoved down your throat. Simplistic, but often moving, dialogue paired with honest facial expressions allow us to understand what these characters are thinking and feeling, and what the take away should be. Cinematically, this road trip does take a while to kick into gear. Early on, Tony comes-off as a bit of a stock character. But gradually, Mortensen (who reportedly gained 30 pounds for the role) is able to bring-out multiple facets of Tony’s character. And we get to experience and appreciate his growth as a person. However, this is Ali’s movie. He shines as the strong yet fragile, impeccable yet imperfect Shirley. This is a performance that surely send him on another journey – from awards show to awards show – in the coming months. Together these two make for one of the year’s most sincere and wholesome on-screen pairings – a duo that audiences will find irresistible. 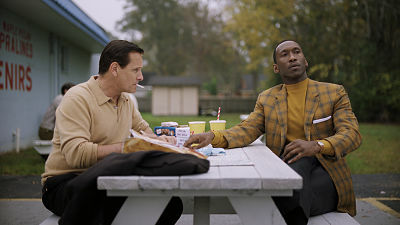 On The Official LCJ Report Card, “Green Book” gets a B+.